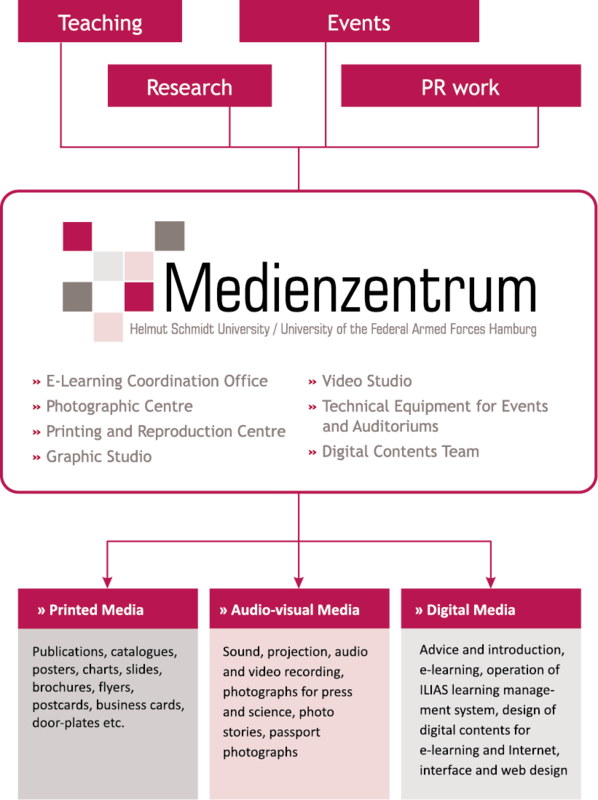 The Media Centre supports the staff of Helmut Schmidt University / Bundeswehr University Hamburg in the preparation and use of printed, digital, and audio-visual media. Media Centre personnel are responsible for the various steps of media preparation – from giving advice, to implementing, to distribution – while working closely with the requesting specialist departments of the university. The Media Centre cooperates with other bodies of the Bundeswehr, with other universities and research, training and further education centres, if there is a related teaching or research project at Helmut Schmidt University / Bundeswehr University Hamburg. The Media Centre is a member of “Arbeitsgemeinschaft der Medienzentren an Hochschulen”, of “ILIAS e.V.” and of the “Deutsches Forschungsnetzwerk e.V”. Staff members will find detailed information on the individual services in the ILIAS learning management system under “Medienzentrum” (Media Centre).